The Public Defender’s Office routinely participates in collaborative efforts in our community to assist in sealing and expunging of eligible criminal records and the restoration of Civil Rights lost with a felony conviction. For more information on these processes and to find out if you are eligible, please call 561-355-7655. Palm Beach County Public Defender Carey Haughwout facilitates a panel discussion on successfully overcoming barriers to returning home from incarceration. The Palm Beach County Public Defender’s Office cohosted a two-day October 2018 Reentry Summit with community partner The Lord’s Place. 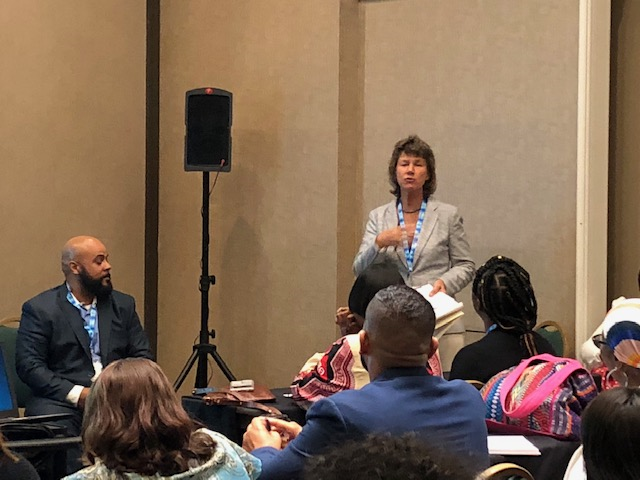 The summit brought together thought leaders from across the nation to talk about innovations and best practices in the delivery of effective services to those returning to communities from jails and prisons. Participants heard from community based providers, court system leaders, corrections officials and - most importantly - those with lived experience. July 2018: Assistant Public Defenders joined 50 other agencies on Saturday, July 27th at Tabernacle Missionary Baptist Church in West Palm Beach at a Health and Wellness Fair. Attorneys Sam Dratch and Michael Brown were able to provide attendees with information on qualifications for sealing and expunction of their criminal record, restoration of civil rights and general information related to understanding personal criminal history. More than 200 people attended the four hour fair where a variety of health and wellness checks and information was provided by community agencies. In September 2017, the Public Defender’s Office responded to the devastation of Hurricane Irma by opening our Belle Glade office to assist those impacted with application to FEMA for financial aid. Over the course of the day, volunteers assisted in the completion of more than 200 applications. Many members of the Glades community have since shared stories with us about the financial assistance they received and how that helped them rebuild their lives. High school students interested in the criminal justice field are invited to participate in an essay contest to learn more about areas of the law. Approximately 10 schools in our community have contributed essays in past contests on issues such as charging children in adult court and Miranda warnings. The essays are read and judged by staff and lawyers and the top student from each school is honored at a luncheon and spends the day shadowing an assistant public defender. The winning essay is presented by the student at the office’s Gideon celebration.